According to Mark Barocco of Renaissance Conservatories in Lancaster, Pennsylvania, the popularity of the conservatory is seeing a resurgence. The union of architectural refinement, timeless detailing, and quality materials radiates an ambiance of graciousness, and gentility to define a conservatory and differentiate it from an enclosed porch or sunroom. The Orangerie in Paris, now a prestigious museum dedicated to impressionist art, is perhaps the most famous and visited conservatory today. Originally designed for cultivation, the glass enclosed space provided the wealthy and elite classes with fruits, vegetables, and flowers unable to thrive in the local climate. Today's conservatory is conceived to enhance the spirit and create a link to nature with the comforts exemplified in contemporary applied technology. More recently, these garden rooms have been adapted and employed for vast and diverse uses. The Mirage Hotel in Las Vegas sought out Renaissance Conservatories to add distinction and eminence to their four-star restaurant. In New England, the company is constructing a customized glass house dedicated to cultivation of plants for an estate, a reflection of the original intent. By contrast, a College Park couple added a conservatory to expand their kitchen. "They transcend the economic stratum," says Mark Barocco. Many times, smaller, more modest homes have that old requisite, location, a characteristic that frequently takes precedence over size and architectural style. Mr. Barocco finds that a conservatory can add light and space yielding definition and presence to a previously undistinguished but highly desirable and treasured home. While it is easy to become enamored with the idea of a conservatory, for the captivation to endure, it must function for the owners. "I think Americans are just beginning to discover this delightful lifestyle. As they travel abroad and visit England and other parts of Europe, they have the opportunity to enjoy these spaces and ask, "why don't we do it over here?" says Mark Barocco. However, this isn't Europe. "The climatic conditions are far different. What works there doesn't always work here." So he addresses issues like the orientation of the house and the amount of shade. He finds he needs to use less glass in the roof, but to use it more strategically, more dramatically. "It gives homeowners the light they want and the feeling of an all-glass room, but it also introduces a degree of function and comfort that is so important in creating a successful living space. 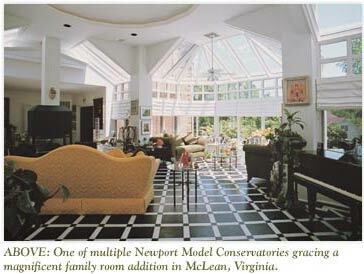 The conservatory is adaptable, reflecting the diversity of an owner. Mark Barocco highlights many of the uses: a library, casual or formal dining room, music room, spa room, family room, living area, and, of course, a building to cultivate plants. "Most of our clients have a penchant for plants," says Mark Barocco, pointing out that gardening is the biggest hobby in this country. And plants soon appear in conservatory spaces regardless of the intended function. It seems to be a natural step to bring some of nature inside as walls of glass draw attention to the outside world of gardens, rolling hills, and the changing of the seasons. To create the structure, glass is cut in geometric forms of squares, circles, and triangles. Arches are rounded with a Roman influence or pointed with a Gothic touch as the glass is framed in mahogany, western red cedar, or redwood-the details coming from an architectural heritage of time-honored elements. Placed in rows or stacked in tiers, the shapes are juxtaposed for a symphony of shape and form. This composition sets the conservatory apart, making it a truly customized feature. With comfort taking precedence, today's conservatory may include a motor to make opening the high windows easy-taking advantage of natural circulation by drawing air up and out. Retractable blinds filter the sunlight or create soothing shade from the high, intense summer sun. Now, the conservatory is seeing a renaissance as new technology is combined with centuries-old charm. For further information, call Renaissance Conservatories, 800-882-4657.